Toei has finally released the official minute long trailer and movie poster for the upcoming Lupinranger VS Patranger VS Kyuranger team-up movie! 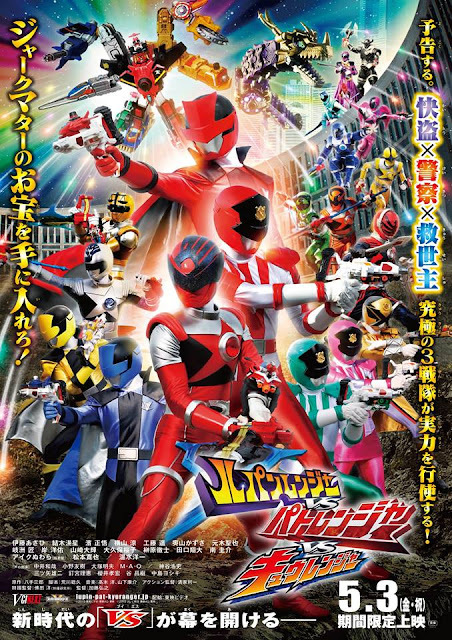 VciNEXT's Lupinranger VS Patranger VS Kyuranger will have a limited theatrical run this coming May 3rd and will soon be released on DVD and Blu-ray on August 21st. Can you say "too many cooks"? The group henshin/roll call scene, while a hallmark in teamup movies, is going to take up half the movie since there will be three teams doing their individual roll call. Add to that the fact that the movie ALWAYS slows to a crawl during at that point, even though it quickly regains momentum with both teams charging into battle together.